LOL/OMG: Walker puts Music and Movies in the Park on "hiatus"
Walker puts Music and Movies in the Park on "hiatus"
We can all agree that Summer Music and Movies in Loring Park is one of the most popular, if not THE most popular summer outdoor event in the city. Well, you can say goodbye to that: Walker decided NOT to have it this year. (Insert sad trumpet sound here). 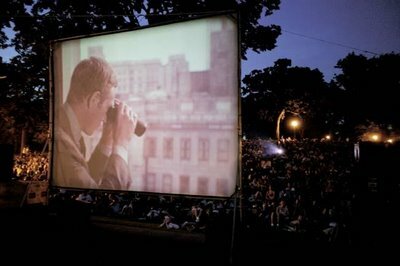 Walker Art Center sent out a press release stating: "Due to the density of programming being organized by the Walker, Music & Movies in Loring Park will take a hiatus this summer." Upon further inspection we concluded that the actual loss might not be that great: technically, they didn't cancel the event for good (or so they say), and with the new Walker Open Field events coming up, displaced fans will still have plenty to do. Not to mention -- Mears Park in St. Paul has an equally awesome, although smaller, weekly movies and music event that we totally endorse. Simon Peter Groebner: Summer apocalypse. Blast you, Walker! Bobby Kahn: Sadness falls. Worst part is missing out on the Frisbee-dancer. I hope I can find him jamming out somewhere else this summer. Ben Clark: I find there are people who still avoid Loring Park due to its old reputation, and Music and Movies was a great way to get people out there. mkfiasco: Let's move it to my backyard. AlludedInSquint: Riot in the park, anyone? Ah! This is terrible, music and movies in the park was the best. Just another reason to hate the walker. What's next? Now they want to have their* music and their* movies in their* park, and sell you their* concessions.